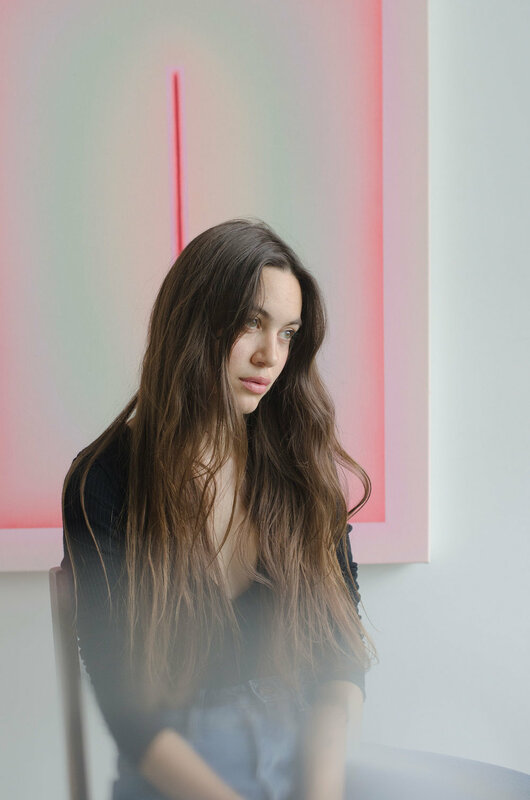 Alina Maria Birkner is a young artist from Munich, whose work is mainly based on colour and light and how colour can affect the viewer. Her large paintings tend to feature a dreamy interplay between softly blended pastels and definite linear margins and geometric shapes and it is easy to get lost in a far-off space beyond the artist’s aesthetically enticing invitations to another dimension. Having only graduated from the Academy of Fine Arts Munich last year, she has already held a solo exhibition, "Cosmic Love / Rosy Dawn”, at Miranda Kuo Gallery in New York and shown at Viennacontemporary 2016 with Jecza Gallery. This is an artist who has been on our radar at Ennigaldi for several months and we are delighted to commence our “Behind the Art” interview series with a peep inside her world. I drink tea because caffeine is too stimulating for me. Difficult to answer. As my parents are both artists, it felt natural to me to be creative from a very young age. Not really. But when I was 11, I decorated my whole room with watercolours of horses I had painted. It was almost like an obsession. Yes I do! David Bowie, classic rock and also some hip hop or girly music. Anything that puts me into a good mood! 7. What’s your favourite colour and why? My favourite colour has always been pink - it was also the crayon I used the most when I was a child. But can I also say rainbow? Because I really love the whole spectrum… especially when together! Hilma af Klint, but really, there are many more. They are all equally important; stretcher, canvas, brushes, water, paint. In my studio. There is not much that can distract me there. Always my most recently finished painting, where I can see my progress. But there is also self-doubt involved. I am preparing for Viennacontemporary 2017 in September and also an art in architecture competition. A spiritual connection is important to me. Art that you can experience, that makes you feel like you are connected, that has a strong energy field but without disregarding aesthetics. James Turrell and Olafur Eliasson. I can’t decide, there are many cities I like to visit! Paris, New York, London, Florence and Krakow are on my list… although I am more of a country person. When I was a child, we used to go to the Polish coast every summer. I have many beautiful memories of the Baltic sea. Then Italy. And a couple of years ago, I was lucky enough to visit Hawaii, which is probably one of the most beautiful places on this planet. Pace Gallery, Musée de l’Orangerie in Paris and in Munich, where I live, the Lenbachhaus. Oh that changes so quickly. But I always need fabric to feel good on my skin and cuts that are comfortable yet elegant. So nothing too complicated to war. An actress or a scientist. I am also interested in Psychology. Listen to your inner voice and learn to trust it. The more you grow into your true self, the more you are able to express yourself or your message freely. And remember - there is no such thing as perfection.